I’m a self-pay patient, so I won’t be able to afford nice glasses. We love self-pay patients! And we understand that insurance can be expensive. Therefore with self-pay patients we are able to bypass the insurance companies, making the transition simpler and smoother, and we appreciate that. We will work hard to make things affordable and have you leave with something you love. When you buy something of quality, you’ll be able to use it for longer and may end up saving you money in the long run. I’ll save going to 1-800-CONTACTS. Not really. Contact lens prices are ultra competitive now. If you buy them at the office it may be a few dollars more expensive or even the same. The benefits are that if you lose a lens or tear a lens, we often can give you a free replacement, and you wouldn’t have to reorder and wait for the contacts to come in the mail. Glasses are less expensive at a commercial setting like Lenscrafters or Cohens? Sometimes true. They do tend to run a lot of specials for frames and lenses for $100. Most private practices can also do that, but remember, for that price it’s usually a very basic set no matter where you go. For designer frames the prices are about the same, but many times a private practice will carry independent luxury brands that is often better for similar prices. Not necessarily true. Think of it this way, if you need the spring hinges to get the glasses to fit, then those glasses may not be a good fit. Just like clothes, buy the ones that fit, not the ones that almost fit. 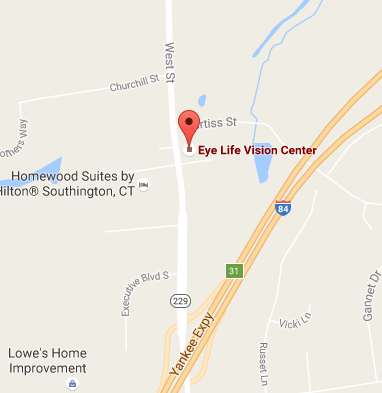 Won’t I save money if I buy my glasses online instead of with Eye Life Vision Center? In some instances you may save some money, but there are other things to consider besides the price point. Without trying on the actual glasses, you will never know how it will look or fit when you get them, or if the construction is of high quality. At our vision center, you’ll have trained professions to help you select the right frames to ensure that it will look great and fit correctly. Furthermore, if there is a problem, we can troubleshoot locally, as opposed to online retailers where you’ll have to deal with automated answering systems and the hassles of shipping your glasses back and forth. Many people are apprehensive about buying clothes online because of these same reasons. Before you even consider buying online, please check out our selection, as we have a wide ranges of frames that will meet almost any budget. This statement is one we find particularly aggravating, but unfortunately it has been perpetuated for a long time, especially by those that have never gone to see an optometrist. Although this comparison is easy to make, our roles in the eye care field is very different. It would be like comparing a surgical cardiologist to a primary care doctor. You wouldn’t go to a cardiologist for the common cold, would you? Ophthalmologist are skilled surgeons of the eye, while optometrist are the primary care doctors for the eyes. We will detect, manage, and treat many eye diseases, and when a surgeon is needed, we will find you the best ophthalmologist for your issue. Also remember, many ophthalmologist are specialized in either retina, glaucoma, cornea, or oculoplastics, and often do not cross manage in other fields. Many are not even interested in doing contact lens fitting or careful refractions, because their primary focus is on surgery.